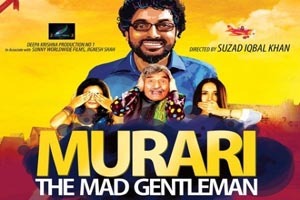 Murari- The Mad Gentleman is a 2016 Hindi comedy film directed by Suzad Iqbal Khan and jointly produced by Kishore N Patel, Sunil Patel, Jignesh Shah. This film stars Sanjay Singh, Asrani, Natalya Llina, Surendra Rajan, Kiran Sharad, Yajuvendra Pratap Singh, Amitabh Acharya. All the songs of Murari - The Mad Gentleman is composed by Biswajit Bhattacharjee and lyrics are written by Krishna Bharadwaj. Here is the link of all the songs lyrics and videos of Murari - The Mad Gentleman.